Looking for a nice looking LED Bar to put in a corner? This 1 meter long rigid aluminium LED bar from LED Montreal has a V shape for easy installation in a corner or simply project light at a 45° angle. The LED bar has 120 super bright Epistar 2835 LED chips that will allow great illumination. Since full brightness may not always be required, the 1m Rigid LED Bar comes with a light diffuser that will allow you to reproduce a neon effect. It also provides a clean finished look for all sorts of applications. It comes with a choice of 3 types with different shapes and angle width. 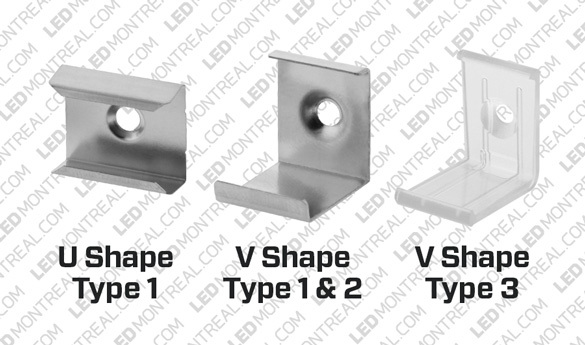 While type 3 is the regular shape, type 1 and 2 will allow a wider 90° beam of LED light. You can select your prefered type in the drop down menu. The basic kit comes with a Wall Dimmer, but it can also be upgraded to get more options using the drop down menu. Please note that the Rigid LED Bars are not self adhesive. We recommend using the Double sided 3M Acrylic tape for LED Strips to 1) secure the LED circuit to the bar by adding 3 to 4, 1 inch pieces of tape on the 1 meter circuit and snap it in place 2) install the Rigid LED Bar to the desired surface. We recommend adding double sided tape on the full length of the bar for secure installation. Each circuit supports up to 4 Rigid LED bars; once again, the amount of desired bars can be selected in the drop down menu. The Bars can be joined together by joining each of the 2 wires located on each end, ensuring to respect polarity and properly isolating the wires with electrical tape. You can also customize the wire length between each LED Bar by using 12V DC Extensions. Our kits include everything required to operate your new LED 1m Rigid bar set up. We will even provide you with the accurate power supply for your personalized set up: 12V 2A for 1 Bar, 12V 3A for 2 Bars or 12V 6A for 3 or 4 Bars. For each 3 or 4 bar kit, we suggest using a DC Y-shape splitter to split the circuit in the middle and distribute the power as evenly as possible. White LED bars can be used for different applications, thanks to its two available shades of white: Warm White, which is suitable to replace most incandescent lights and Cool White that is preferable for locations where a neon would normally be used. For more information on which shade would suit your needs, visit the LED Bulb buying guide. What is the temperature of the light in Kelvin? What is the power of the light in lumens? Depends if you are looking for cool or warm white.